SSID Broadcast is a feature on your router that allows you to let other wireless devices see your wireless network. Disabling the SSID Broadcast feature adds security to your wireless network since it will be hidden from intruder’s view. If you have a range expander, you can still connect it to your wireless network by matching its wireless settings with the settings of your router. The Linksys range expander requires specific firmware versions installed on a Linksys wireless router or access point to connect. If these requirements are not met, the expander may encounter problems connecting to the network. For instructions on how to check the firmware version on a Linksys wireless router or access point, click here. • If your wireless router did not meet the minimum firmware required, update your router’s firmware. For instructions, click here. • If your access point did not meet the minimum firmware required, update your access point’s firmware. For instructions, click here. The range expander and the wireless router or access point need to have the same wireless settings in order for them to connect. • For instructions on how to get the current wireless settings of your wireless router, click here. • To get the current wireless settings of your access point, click here. NOTE: If you’re using a non-Linksys wireless router or access point, contact the manufacturer to get the wireless settings. Access the range expander’s web-based setup page. For instructions, click here. NOTE: If you are using a Mac computer to access the range expander's web-based setup page, click here. On the web-based setup page, enter the current wireless settings of your wireless router or access point such as Wireless Network Name (SSID), Channel, and Wireless Security. Select Enable on the Wireless Security section then click Edit Security Settings. Under Security Mode, select the same wireless security (WEP or WPA) set on your wireless router or access point. 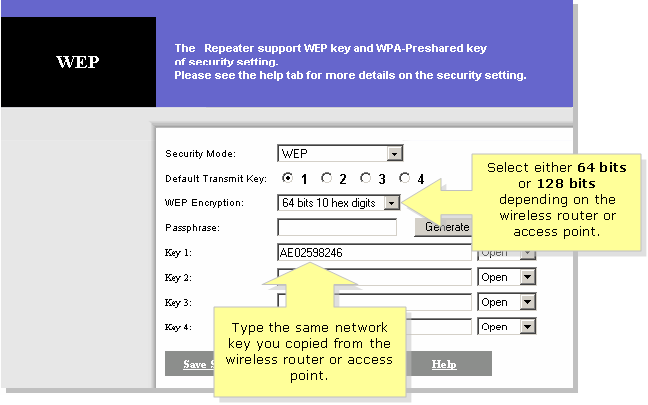 If WEP Encryption is enabled on the wireless router or access point, type the same key you obtained from the router. 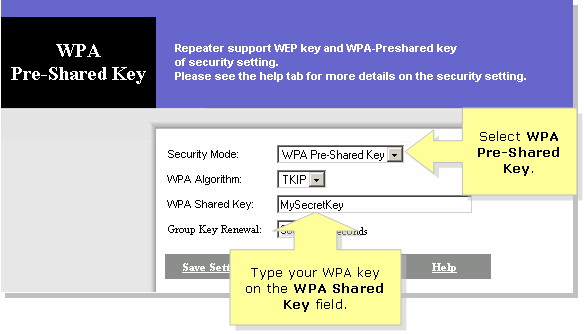 If WPA is enabled on the wireless router or access point, select WPA and type the same WPA key you obtained from the router. NOTE: The WRE54G only allows WEP and WPA Security key. If your router is set to WPA2 Personal security, the settings will not match with the expander’s wireless settings. Click on the setup screen. Your range expander should now be connected to your router or access point.